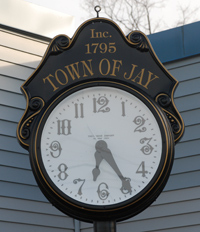 JAY - Residents will have an opportunity to be heard in regards to the town's municipal and school spending on April 23, with polls for the annual town meeting vote opening at 8 a.m. While Selectperson Judy Diaz is running unopposed for another three-year term, there are four people running for two seats on the Regional School Unit 73 school board: Douglas DiPasquale, J. Lynn Ouellette, Tarek Nadeau and Kerry Jackson. This year's municipal budget is proposed at $5,309,596, representing a nearly 14 percent decrease in expenditures as compared to the current fiscal year, or $858,000 in total reductions. Most of that decrease relates to the conclusion of a $4 million settlement agreement with Verso Corporation regarding to the Androscoggin mill. With the settlement payments factored out of the budget, the proposed $5.31 million in expenditures would be 8.8 percent greater than those in the current fiscal year. The budget incorporates a projected $184,100 increase in revenue to $1.95 million, an increase of 10 percent. If realized, that would represent a reduction in net expenditures - subtracting municipal revenue - of nearly 23 percent as compared to the fiscal year. Increases in the budget include additional funds in capital reserve accounts that were not fully funded while the settlement was being paid. One new item is $50,000 in funds to be matched by $50,000 in Regional School Unit 73 funding to support the establishment of a school resource officer position. Both budgets would need to be approved to create the position. There is also a proposed $50,000 increase in the paving reserve account, to $300,000. Also on the Jay warrant is a question asking residents if they wish to "opt in" to authorize marijuana-related businesses to open in town, including medical marijuana stores, as well as cultivation, products manufacturing and testing facilities. Residents can vote 'yes' to authorize such businesses to open, in accordance with state law, or 'no' to prohibit future businesses from opening in Jay. Another article would create a Special Amusement Ordinance for the town, effectively allowing it to continue past practices. Currently, Jay issues special amusement permits for $10 to businesses and non-profits that have live entertainment at an establishment serving alcohol. Recently, town officials learned that towns must have an ordinance to issue permits. Roughly four or so permits are issued each year, some for businesses and others for non-profit organizations. The new cost for the permit would be $25. The RSU 73 validation referendum will be held on April 23 in Jay, Livermore and Livermore Falls, allowing Jay residents to vote on both budgets at the same time. The $19,567,397 RSU 73 budget would represent an increase of $762,853 over the current fiscal year, or 4 percent. The budget would be funded by $10.2 million in local revenue, an increase of $897,189 over the current fiscal year, and another $9.36 million in state and other funding. Relating to the K-12 school budget, Jay would see an increase of roughly $487,000 in its local assessment; Livermore would see an increase of $183,000; and Livermore Falls would see an increase of $228,000. Those figures don't account for an additional $60,000 in funding for Adult Education, $20,000 from each town. Increases include a $195,000 contingency, aimed at preventing another budget freeze this year. The district's budgets have been frozen during the current and previous fiscal year due to unplanned increases such as new Special Education students moving into the district, unexpected construction costs and, this year, an additional 30 Kindergartners that hadn't registered prior to the start of school. If the contingency isn't used, it becomes part of the district's cash balance to help pay for the next budget. Also included within the budget is the other $50,000 for a school resource officer. That expenditure is contingency upon Jay voters approving a like appropriation on their municipal warrant in April. Other significant increases include additional debt service funds relating to the energy efficiency renovations at district schools and the buy-out payment for former Superintendent Todd LeRoy. The referendum is a yes/no format, asking voters if they either approve of the $19.6 million budget set at the district-wide budget meeting or reject it, effectively restarting the process. Polls will be open on Tuesday, April 23 from 8 a.m. to 8 p.m. at the Community Building. Does anyone know why Jay will pay for half of the resource officer while the other half comes from the school budget? Should't the cost be shared with the three towns? In the sun journal article it says that the officer will be part of the Jay PD when they are not at the schools. Why should Livermore and Livermore Falls pay more for the SRO when they won't be part of the Livermore Falls PD? The town of jay is being asked to provide 50% of the cost of the police officer for the 2 months in the summer that school is not in session. We are then expected to pick up another 70% of the other half that is part of the school budget. No way is this fair to the Jay taxpayers. If a school resource position is needed, it should be funded 100% by the school department. There is no need to have a school resource officer working over the summer when school is not in session. The way it works at Mt. Blue is the school budget pays for the sro during the school year then that person goes to work in the summer months for the Farmington pd. There’s no reason to have a part time person doing this job. And fairly gasped for breath." These are the opening stanzas to a 1908 childen's publication called "The Hole Book" by Peter Newell. When I served as interim superintendent last winter in AOS 98 down on the coast, these few lines are a pretty apt description of what could have happened in the middle school cafeteria. A few years before, boy brought a gun (parents didn't realize he'd taken it) to school to 'impress' his friends. He had no intention of shooting anyone. But "he didn't know twas loaded." The school resource officer had the gun in his possession within 90 seconds of the report even though he was in the high school building next door to the middle school. A few weeks ago. A fellow (allegedly) threatened a school employee before school started for the day. The Jay police department responded quickly and fortunately this man's menacing moves did not result in an act of violence. However had this man been armed and intent on murder, a school resource officer would have been quite an asset to have in place. In this day and age, I have to ask, doesn't it make sense to have at least one person working within a collection of buildings housing over 1700 children and adults whose full time responsibility is security and safety? As former Governor Longley liked to say "Think About It."